The hip joint is a stable ball-and-socket joint. Dislocations of this joint rarely occur without other injuries, such as a broken thigh bone or pelvis. These injuries are typically caused by high-impact trauma such as a car or bike accident or a fall from a significant height. 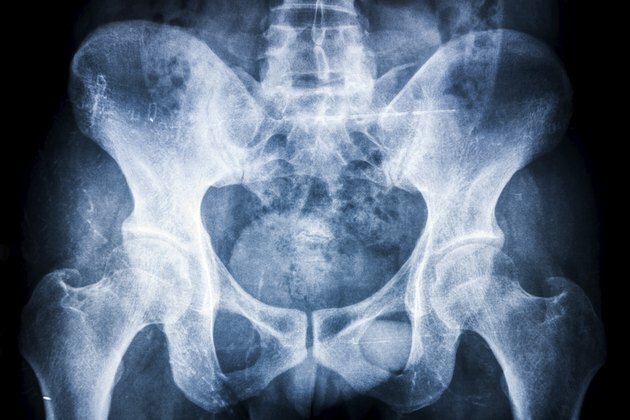 Symptoms of hip dislocation include pain, tingling and deformity. If you suspect you have a dislocated hip, seek immediate medical attention to reduce the risk of long-term complications. Hip dislocation is a very painful injury. In addition to your hip, the pain may spread to your back, groin, thigh or knee -- particularly if you attempt to move or stand on the injured leg. Nerve damage can also occur with a hip dislocation, causing numbness and tingling in your leg and foot. Deformity is a key symptom of hip dislocation. You may notice that your leg looks twisted after this injury. If the ball pops out of the socket backward -- occurring approximately 90 percent of the time -- your thigh will bend up and turn in toward your body. If your leg is rotated outward, the ball may have popped out the front of the socket. The injured leg may also appear shorter than your other leg.